A strict Carthusian order famed for their self denial, the Charterhouse monks were widely respected by lay people. Ten monks refused to sign Henry VIII's 1537 Oath of Supremacy and the king viewed them as dangerous opponents. The monastery was dissolved later the same year and its buildings used as a residence by various noble families. In 1644, a school was opened on the site for the education of "44 poor boys." 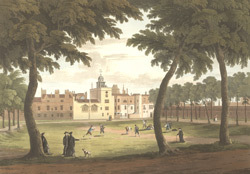 Scholars from the Charterhouse school are depicted playing in the green while their schoolmasters look on.